Probably the most conspicuous member of our native polyporei remains to be considered among the esculents, though until recently it was included in the black list, Dr. Curtis, of North Carolina, I believe, having first demonstrated its edibility, though pronouncing it merely "tolerable." The brilliancy of its sulphur-yellow and orange-salmon colors, in association with its large size, renders it a most conspicuous object, especially from its habit of growing in dense clusters, often a number of such clusters in close contiguity upon a decaying stump or prostrate log, frequently so numerous and so crowded as to completely conceal the bark beneath, as shown in the accompanying figure, or completely covering a space of several square feet. There lies before me even as I write a fragment of a single cluster which I plucked yesterday from the trunk of an apparently healthy red-oak near my studio, the remainder of the clump having been enjoyed as a special course in my dinner of last evening. In Plate 26 I present a portrait of this specimen, the well-named Sulphur Polyporus - Polyporus sulphu-reus. 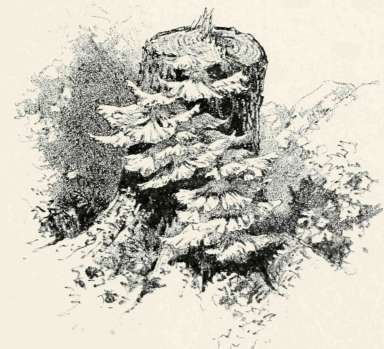 It may be found frequently from July till frost upon its favorite habitat of old trunk, stump, log water-trough, or fence-post, usually upon wood in the early stages of decay. 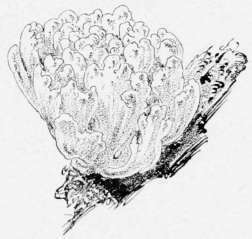 A single cluster will often measure a foot in diameter through its very solid mass of thickened pulpy branches, its early and esculent stage being thus compact with the subdivisions ascending-from their common thick stem, the mass somewhat suggesting a cauliflower in shape, as shown in the illustration above. The general color at this tender stage is pure sulphur-yellow, this being the ultimate lower or spore surface now exposed by its upright position. The true upper surface or cap of the later eccentrically branched fungus is of a bright orange-salmon color, and is mostly concealed by the crowded growth. The specimen above alluded to would have weighed about two pounds, and this central mass was so crowded as to afford scarcely a glimpse of the pinkish-orange pileus surface. Upon showing my specimen to a friend, I was informed that a certain log by the roadside about two miles distant was covered with this same kind of fungus, which seemed to be spreading all over the ground. Doubtless ten or twenty pounds of good nourishing food was thus going begging by the way-side, even in sight of a rural homestead, whose lord and master finds the butcher's bill a serious drain upon his resources. My plate shows a more open cluster of the fungus in its earlier stages, the only time when it is fit for food. In this condition it is tender, succulent, and juicy. In a few days the lobed fringes or fan-like divisions have lowered and spread out as widely as their crowded condition will permit, assuming the horizontal or even drooping position seen at C, and at D in the plate, as viewed from above. The pileus now being exposed, the fungus presents a deep orange-red or salmon color to the beholder, its sulphurous-hued pore surface being turned beneath. Its texture at this adult stage is tough, fibrous, and almost woody, especially as it approaches the stem, and no one would think of eating it. The young specimen, however, is quite delicious and wholesome, and, considering that a single cluster will afford a dinner for a large family, its importance as a food product, especially to the farmer or peasant who finds economy a necessity, is thus manifest.